I found this recipe on the Forno Bravo Wood-Fired oven forum. I made it with Meyer Lemons and it was amazingly delicious! Prepare your dough ball into a 12″-14″ pie. Spread a thin layer of mascarpone cheese across the entire pie, leaving a thin edge of the pie exposed at the outer circumference (just like you make a traditional pie). You don’t need much cheese; you’re simply using it as a binding agent for the lemons. Now layer your thinly sliced lemons. 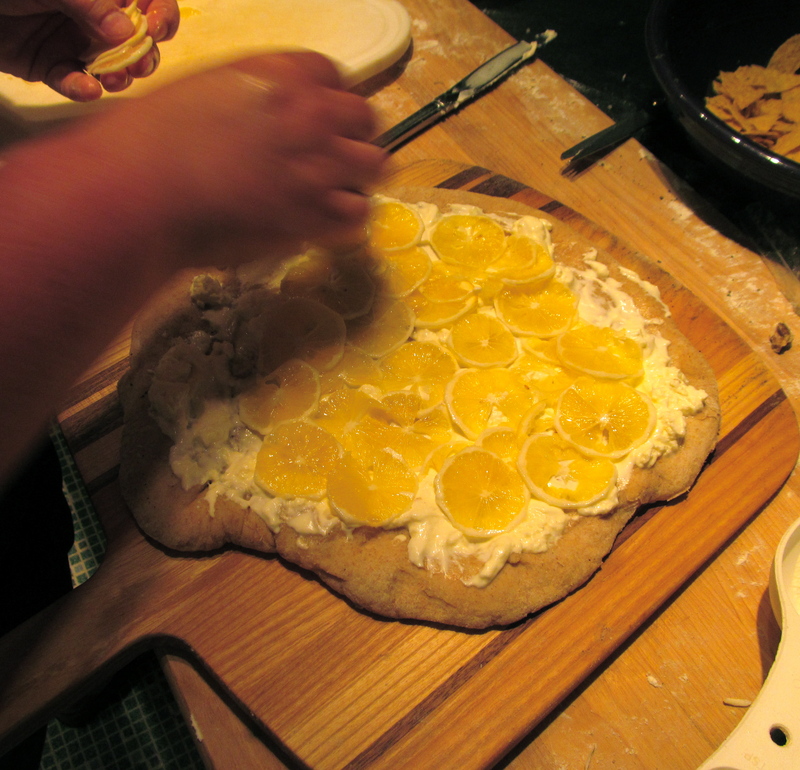 Starting at the center of the pie and, building outward, create a spiral and cover the mascarpone cheese. You’ll likely need 3 lemons to cover the pie. Now brush a thin layer of butter onto the pie, covering all of the lemons. Now for the insanity: Using a flour sifter, gently sift confectioners’ sugar throughout the surface of the pie. Cover it with a good amount. Don’t be shy, but don’t “dump it on.” Completely cover with a single layer, then wait. You’ll notice that the sugar will appear to “melt.” It will look like a liquid. That’s good. Now repeat the process of covering the pie with another layer. Repeat this process – it will take at least 4 layers (perhaps more) – until the sugar no longer liquefies, but instead starts looking like powder. You’re done. Slice and serve. Enjoy! I had my oven set to 525°F and baked directly on my clay tiles. I par baked the crust (baked it in my hot oven) for 2 minutes to firm up the crust and make sure the middle was well cooked. 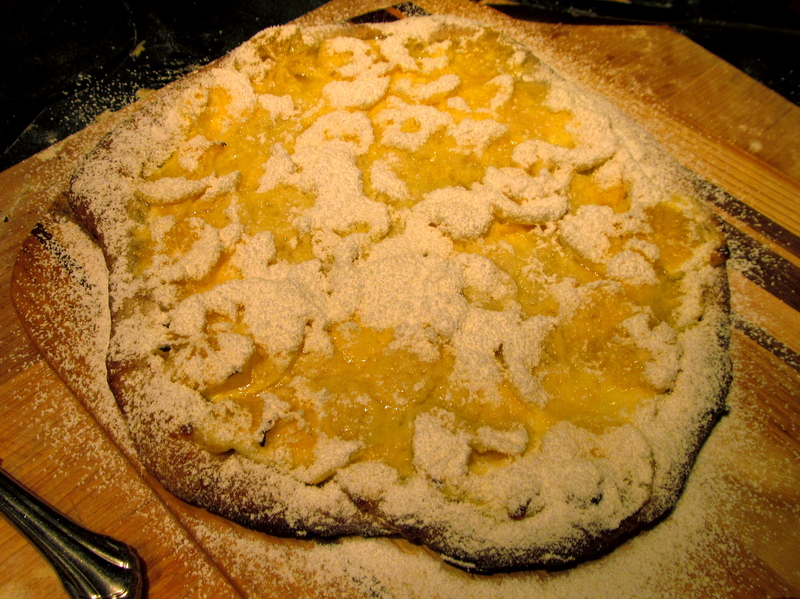 For this pizza I used Meyer lemons, and closer to 2/3 c sugar. With a traditional, sourer lemon it might need more sugar. Hold it over the sink to dust with sugar. DOH! Put the lemons in freezer for 15-20 minutes to before slicing to firm up the lemon and make it easier to make uniform, thin slices. I needed to make a birthday cake, and had some very ripe bananas on hand, so started looking for a banana cake recipe. I found this recipe on Epicurious, and it seemed like it would work, and it would help me use up some sour cream aging in the fridge. 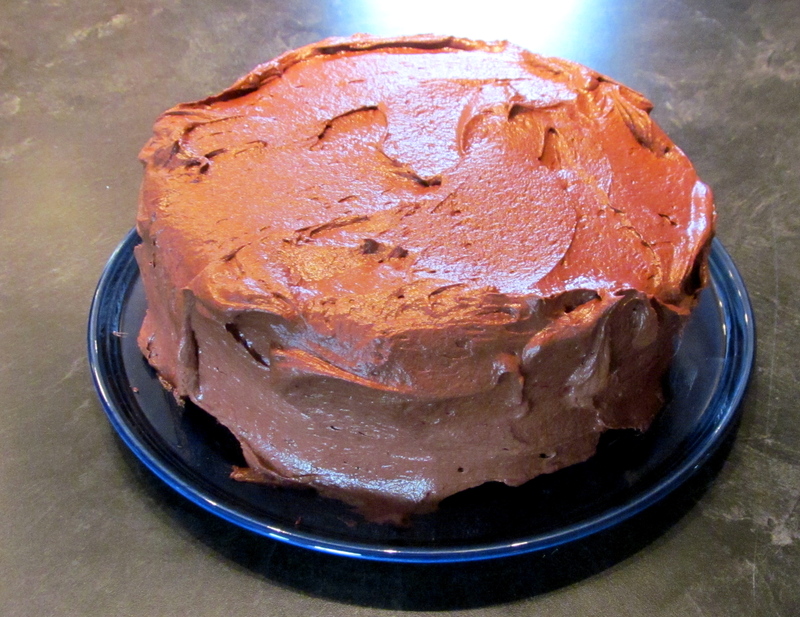 I needed to make a few changes to meet my available ingredients/equipment and desire for chocolate frosting. The recipe below reflects my changes. Preheat oven to 350°F. Grease and flour 2 9” round cake pans )or line bottom of pans with parchment). Whisk flour, baking soda, and salt in a medium bowl. Beat sugar, butter, and brown sugar in a large bowl until light and fluffy. Add eggs one at a time, beating to blend between additions and occasionally scraping down sides and bottom of bowl. Beat in vanilla, bananas and sour cream. Add dry ingredients; beat on low speed just to blend. Fold in mini chips. Divide batter evenly among pans and bake cakes until a tester inserted into the center comes out clean, about 35 minutes. Transfer to wire racks; let cool in pans for 15 minutes. Turn cakes out of pans and let cool completely. Melt chocolate and cool until barely lukewarm but still pourable. Mix cocoa powder and 7 tablespoons water in heavy small saucepan. Stir over medium-low heat until smooth and thick but still pourable, adding more water by teaspoonfuls if necessary. Allow to cool to room temperature. Beat butter and 1/3 cup confectioner’s sugar in large bowl to blend. Add melted chocolate, vanilla; beat until smooth. Beat in cocoa mixture. Gradually add remaining 3 2/3 cups powdered sugar and beat until frosting is smooth. For a flavor kick, stir a tablespoon of Kahlua in a the end. In a large bowl, beat the butter and the peanut butter together until fluffy. Add the sugars and beat until smooth. Add the egg and mix well. Add the milk and the vanilla. Add the flour mixture and beat thoroughly. Stir in the chocolate chips. Place the remaining sugar — in a small bowl. Scoop dough, form into a ball, and roll in the sugar. Place cookies on ungreased cookie sheets, and using a fork, gently flatten cookies. Bake for 10 to 12 minutes; remove from oven and cool the cookies on the sheets for 1 minute, then remove to a rack to cool completely. Glamorous, sweet, looks more difficult than it is. In other words, the perfect dessert. Preheat oven to 275°F with rack in middle. Lightly butter 2 9” round cake pans, then dust sides of pans with confectioners sugar, knocking out excess. Line bottom of each pan with a round of parchment or wax paper. Pulse sugar, brown sugar, and cornstarch in a food processor until well combined, or if using superfine sugar, stir thoroughly together . Stir together vanilla and raspberry vinegar in a small bowl. Beat egg whites with a pinch of salt using an electric mixer at medium speed until they hold soft peaks. Increase speed to medium-high and add sugar mixture 1 tablespoon at a time. After all sugar has been added, beat 1 minute more. Add vinegar mixture, then beat at high speed until meringue is glossy and holds stiff peaks, about 5 minutes. Spoon meringue into pans (about 2 1/2 cups per pan) and smooth tops. Bake until meringues have a crisp crust and feel dry to the touch, about 1 hour (insides will still be marshmallow-like). Turn oven off and prop door open slightly with a wooden spoon. Cool meringues in oven 1 hour; the meringues may crack slightly while cooling, it adds to the charm. Run knife along sides of cake pans and carefully turn meringues out of pans. Carefully peel off parchment and turn right side up. Combine yolks, lemon zest, lemon juice, and sugar in a small saucepan. Whisk to combine. Set over medium heat, and stir constantly with a wooden spoon, making sure to stir sides and bottom of pan. Cook until mixture is thick enough to coat back of a spoon spoon, 5 to 7 minutes. Remove saucepan from heat. Add the butter, one piece at a time, stirring with the spoon until consistency is smooth. Cool and refrigerate. There will be extra (YUM!). Beat cream just until stiff peaks form. Stir ¼ c cream into half of the lemon curd to lighten (about 1 ½ c). 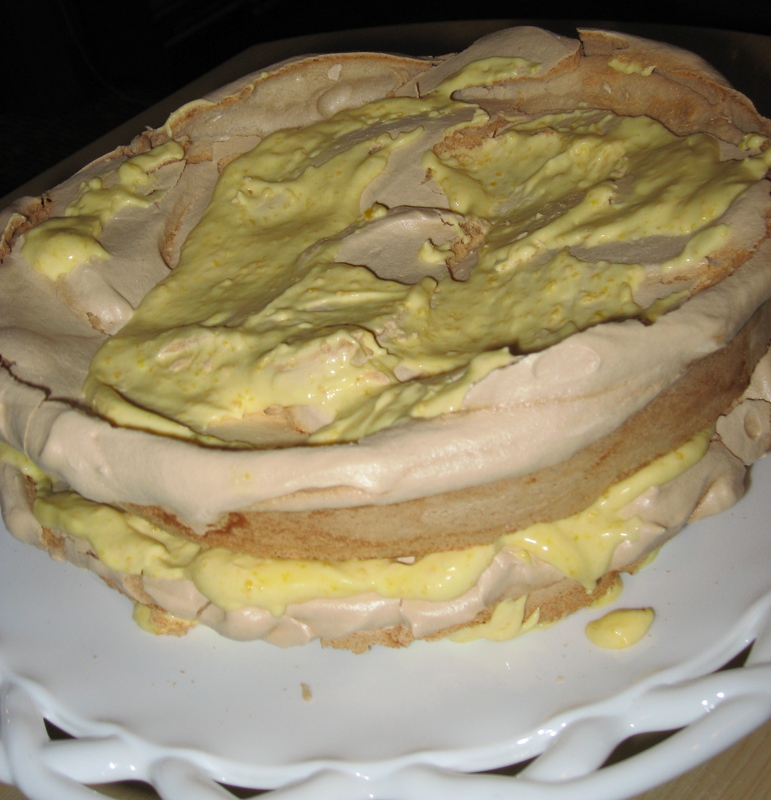 Spread half the mixture on one layer of the pavlova. Add the second layer, and spread the remaining lemon curd mixture. Top with blueberries and remaining whipped cream. Finely chop 1/2 cup of the almonds and reserve. Lightly oil a 15” x 10” jelly roll pan (I used non-stick foil). In a 2- to 3-quart heavy saucepan combine butter, corn syrup and sugar. Bring mixture to a boil over moderate heat, stirring occasionally as sugar dissolves. Boil, stirring occasionally, until thermometer registers 300°F, or until the mixture is the color of dark peanut butter. Quickly stir in almonds and immediately pour mixture into baking pan. With a spatula quickly spread toffee in an even layer. Let mixture stand 1 minute (it will still be very hot) and sprinkle evenly with chocolate chips. Let chips melt and with spatula spread chocolate evenly over toffee. Quickly sprinkle reserved finely chopped almonds evenly over chocolate. 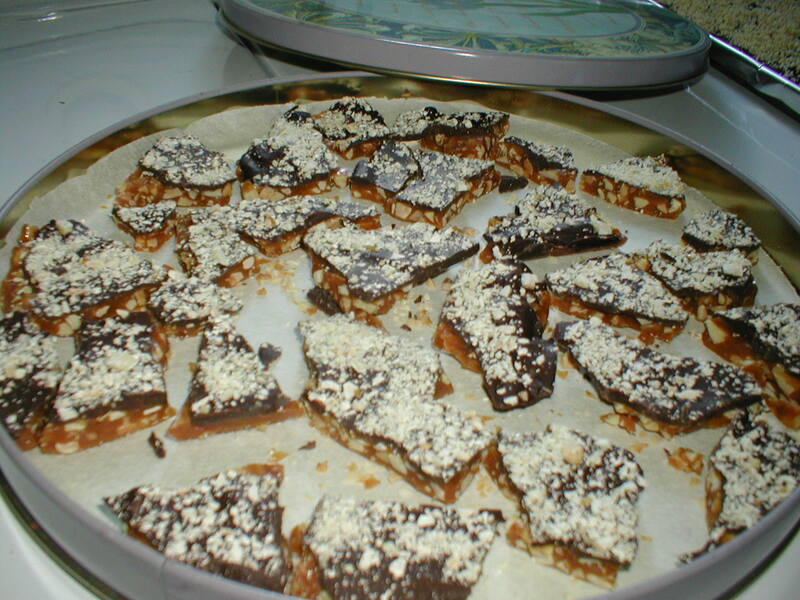 Allow to cool, then chill toffee until chocolate is firm, at least 2 hours, and up to 2 weeks, covering tightly after 2 hours. Break toffee into bite-size pieces and keep chilled to prevent chocolate from melting. Alternately, allow toffee to cool. Melt chips, reserving a few to add once all the chocolate has melted (to help the chocolate re-firm). Stir in the reserved chips until melted, then spread on toffee with a spatula. Sprinkle with chopped almonds and allow to cool. Break into pieces and store out of the tempting line of sight! The ginger cookies were a bit fussy to make, requiring a saucepan to heat the brown sugar, molasses and spices together, but are very good, and the dough is very easy to work with, although I was initially concerned with would be sticky. The only change I might make is to add 1/2 teaspoon of ground white pepper, or up the ginger a bit, but they are pretty good as is! Bring molasses, brown sugar, and spices to a boil in a 4- to 5-quart heavy saucepan over moderate heat, stirring occasionally, and remove from heat. Stir in baking soda (mixture will foam up), then stir in butter 3 pieces at a time, letting each addition melt before adding next, until all butter is melted. Add egg and stir until combined, then stir in 3 3/4 cups flour and salt. Preheat oven to 325°F. Transfer dough to a lightly floured surface and knead, dusting with as much of remaining 1/4 cup flour as needed to prevent sticking, until soft and easy to handle, 30 seconds to 1 minute. Halve dough, then wrap 1 half in plastic wrap and keep at room temperature. Roll out remaining dough into a 14-inch round (1/8 inch thick) on a lightly floured surface. 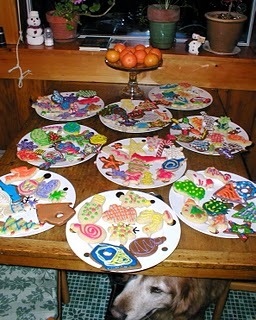 Cut out cookies and transfer to baking sheets. Bake cookies until edges are slightly darker, 10 to 12 minutes total. Makes about 4 dozen cookies. These sugar cookies are my favorite for decorating cookies, but of course I love citrus as a flavoring. Stir together flour, baking powder and salt into medium bowl; set aside. Beat butter and zest in large bowl until light. Add sugars and beat until fluffy. Beat in egg. Add dry ingredients and stir until soft dough forms. Divide dough into thirds. Gather each third into ball; flatten into disks, wrap each in plastic and refrigerate until firm, about 4 hours. Preheat the oven to 350°F. Roll out one disk of dough on well-floured surface to 1/8- to 1/4-inch thickness. Cut out cookies and bake on ungreased cookie sheets until cookies turn brown on edges, about 15 minutes. Cool completely before frosting. Frost with my favorite Citrus Frosting. 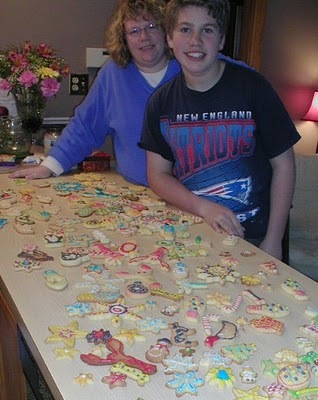 This is Mrs. Barbarossa’s recipe for Christmas Cookies. These are Dan’s favorite cookie, Italian cookies, so-called because as a kid, his family was good friends with an Italian family, the Barbarossas. It makes a HUGE batch…. Cream the Crisco and sugar. Add eggs, beating after each egg. Stir in the flour and baking powder, mixing well. Chill for at least 2 hours or overnight. Roll out about 1/2” thick. Bake at 350 for 12-15 minutes. Cool, and frost with Citrus Icing or Royal Icing. *I’m not a Crisco fan but in these cookies, butter does not substitute well. I’ve tried. Sigh. This recipe makes about three cups of icing. Combine lemon juice and milk in large bowl. Whisk in 5 cups powdered sugar. Gradually whisk in enough remaining sugar by 1/2 cupfuls to form icing stiff enough to pipe (mixture will resemble stirred sour cream). Divide remaining icing into zip-loc sandwich bags, one bag for each desired color; mix food coloring by drops into each bag, tinting icing to desired shade. Carefully knead bag to mix. To decorate, cut a tiny bit off the corner of the bag, and squeeze frosting through. As I’m making the cookies tomorrow, I made the Italian Cookie dough tonight, as it needs to chill thoroughly for best cookie cutting. This year, made with our own Henbogle eggs, the dough is much more yellow than it has been in the past… I wonder what the cookies will look like when baked?